A brief chronology of the events which swept France in May and June 1968. Starting as a student revolt, the events culminated in mass workplace occupations and a general strike of 10 million workers. Followed by a short international chronology. May 1968 has entered into legend - to the point where when new waves of struggle break out in France young people get irritated by the inevitable comparisons to 68 that are aired in the media. The 2006 anti-CPE movement is only the most recent example. Yet May 68 was the most advanced movement of an exceptional year of struggle that remains a high-point of the post-WWII era. Hopes and possibilities were raised high - yet the revolution never came, even though the idea of revolution (though often limited and confused) was a part of the general ferment and atmosphere in a way that seems extraordinary now, looking back from where we are. Our times are in many ways the era of counter-revolution that followed - the outcome of the defeat of the struggles of the 1960s and 70s, when 'the social question' dominated life to varying degrees. Revolt flared in many places; across Europe, in France and Italy particularly - and in the East, the Prague Spring. In Mexico there was a massacre of demonstrators to ensure social peace prior to the Olympics of that year. Yet May 68 in Paris remains the iconic image associated with the year. There was something in the air that year - the events that led up to May were all part of it. 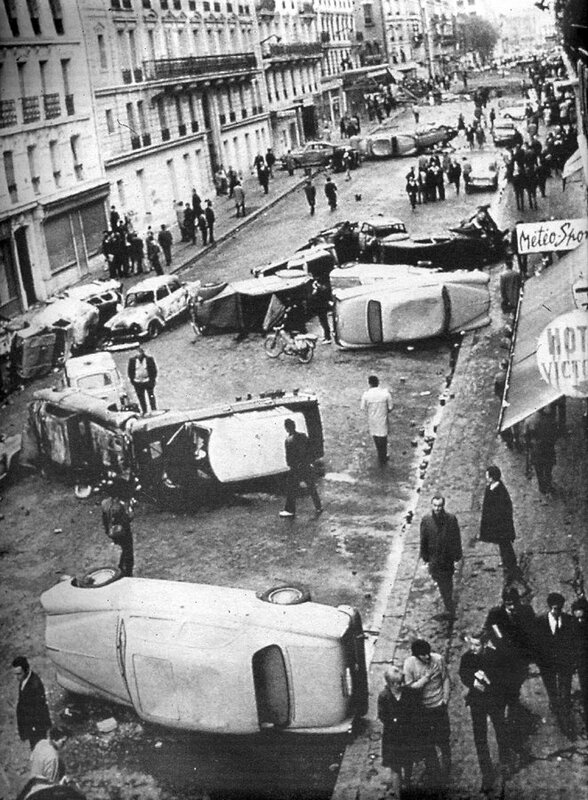 But if the student disruptions at Strasbourg in December 1966 and Nanterre in March 68 and their Situationist inspirers cannot claim to have been the spark that led to the huge upheaval of May, they can claim a contribution; and the Situationist International can claim that they foresaw more clearly than others that such a revolt was becoming possible. The SI can also claim to have written most of the best leaflets and texts during and after the events, as well as many of the grafittied slogans. But no political group can claim 68 - it was notable that it was a mass spontaneous outburst, not instigated or led by any external power. (Though part of its weakness was that it allowed the unions and Communist Party to eventually limit and fragment the movement.) 10 million workers participated in the largest wildcat strike in history - yet most of them allowed the (often Stalinist) union bureaucrats to keep control; the occupations of workplaces were used by unions to keep the workers separated from the wider movement of students and other youth. Those who went to the factories to engage with workers were usually met with locked gates manned by union stewards. The Communist Party and unions were exposed, for all who didn't already know, as the agents of counter-revolution and the party of order and business as usual. 22 March 1968; student radicals and associates invaded an administration building at Nanterre University and held a meeting in the university council room dealing with class discrimination in French society and the political bureaucracy that controlled the school's funding. The school's administration called the police, who surrounded the university. After the publication of their wishes, the students left the building without any trouble. Later, leaders of what came to be known as the "Movement of 22 March" were called together by the disciplinary committee of the university. Thursday 2 May 1968; following months of conflicts between students and authorities at the University of Paris at Nanterre, the administration shut down that university. Students at the University of the Sorbonne in Paris met on 3 May to protest against the closure and the threatened expulsion of several students at Nanterre. Sunday 5 May; Radicals occupied the administration building and held a general assembly. The police surrounded Nanterre, closing down the university. Monday 6 May; Nanterre students came together in the centre of Paris and, after continual harassment and over 500 arrests, erupted into five hours of rioting with police. The national student union, and the union of university teachers called a march to protest against the police invasion of the Sorbonne. A complete ban on demonstrations and the closure of large sections of central Paris brought thousands of angry students onto the streets. In the face of increasing police brutality, more than 20,000 students, teachers and supporters marched towards the Sorbonne, still sealed off by the police, who charged, wielding their batons, as soon as the marchers approached. While the crowd dispersed, some began to create barricades out of whatever was at hand; “Literally thousands helped... women, workers, people in pyjamas, human chains to carry rocks, wood, iron.” Others threw paving stones, forcing the police to retreat for a time. The police then responded with tear gas and charged the crowd again. Hundreds more students were arrested. By the end of the night, 350 cops had been injured in the fighting. The same day, high school student unions spoke in support of the riots. The next day, they joined the students, teachers and increasing numbers of young workers who gathered at the Arc de Triomphe to demand that: (1) all criminal charges against arrested students be dropped, (2) the police leave the university, and (3) the authorities reopen Nanterre and the Sorbonne. Negotiations broke down after students returned to their campuses, after a false report that the government had agreed to reopen them, only to discover the police still occupying the schools. Friday May 10th; Another huge crowd congregated on the Rive Gauche. When the riot police again blocked them from crossing the river, the crowd again threw up barricades, which the police then attacked at 2:15 in the morning after negotiations once again floundered. The confrontation, which produced hundreds of arrests and injuries, lasted until dawn of the following day. The events were broadcast on radio as they occurred and the aftermath was shown on television the following day. Allegations were made that the police had participated, through agents provocateurs, in the riots, by burning cars and throwing molotov cocktails. After massive demonstrations, the Education Minister started negotiations. But in the streets, 60 barricades had been built and workers came down to support the students. The Parti Communiste Français (PCF) reluctantly participated in, with the major union federations - the Confédération Générale du Travail (CGT) and the Force Ouvrière (CGT-FO) - calling a one-day general strike and demonstration for Monday, 13 May. Monday, 13 May; well over a million people marched through Paris; the police stayed largely out of sight. Prime Minister Georges Pompidou personally announced the release of the prisoners and the reopening of the Sorbonne. The surge of strikes did not, however, recede. In fact, the protesters got even more enraged. When the Sorbonne reopened, students occupied it and declared it an autonomous "people's university". Around 400 popular action committees were set up in Paris, including the Occupation Committee of the Sorbonne, and elsewhere in the weeks that followed to take up grievances against the government and French society. Tuesday 14 May; a sit-down strike begins at the Sud Aviation plant near the city of Nantes, where workers lock management in their offices. In the following days, other workers began occupying factories, then another strike at a Renault parts plant near Rouen, which spread to the Renault manufacturing complexes at Flins in the Seine Valley and the Paris suburb of Boulogne-Billancourt. Wednesday 15 May; that night, the National Theatre in Paris was seized and made into a permanent assembly for mass debate. Thursday 16 May; by now workers had occupied roughly fifty factories. Friday 17 May; 200,000 workers were now on strike. Saturday 18 May; two million workers on strike. Monday 20 May; during this week numbers escalated to ten million, or roughly two-thirds of the French workforce, on strike. 4,000 students occupying Sorbonne University went down to support the Renault strikers. 10,000 cops were called up for back up, union officials locked factory gates and the Communist Party urged their members to try and stop the revolt. May 24th; the Paris Stock Exchange is set on fire by protestors. As street demos grew and occupations continued, the state prepared to use brutal force to crush the revolt. Army generals readied 20,000 troops to take hold of Paris with force and police had occupied communications centres like TV stations and Post Offices. Communist Party officials helped manipulate strikers into returning to work. In the case of the Metro, they visited one station and told workers that other stations had re-opened, then they proceeded to move around all the stations saying this. Friday May 25 and Saturday May 26; the Grenelle agreements were signed at the Ministry of Social Affairs. They provided for an increase of the minimum wage by 25% and of the average salaries by 10%. These offers were rejected as inadequate by workers and the strike went on. Wednesday 30 May; several hundred thousand protesters (400,000 to 500,000—much more than the 50,000 the police were expecting) marched through Paris. Thursday 31 May; while the government appeared to be close to collapse, de Gaulle remained firm, though he had to go into hiding and considering abandoning his position. After being assured that he had sufficient loyal military units mobilized to back him if push came to shove, he went on the radio (the national television service was on strike) to announce the dissolution of the National Assembly, with elections to follow on 23 June. He ordered workers to return to work, threatening to institute a state of emergency if they did not. Tuesday June 5; Most workers have gradually returned to work or were ousted from their plants by the police. The national student union called off street demonstrations. The government banned a number of leftist organizations. 6 June; the police retook the Sorbonne. De Gaulle triumphed in the legislative elections held later in June, and the crisis came to an end. 1968 and the whole era of the 1960s and 70s were characterised by worldwide struggles; of workers, of youth, of students. Against work and exploitation, against state, against class society, against authority, against racial, sexual and gender repression, against war, against the stifling morality and conformities of daily life. March 17; a demonstration against the Vietnam war outside the US Embassy in Grosvenor Square, London led to hours of street fighting between police and demonstrators; it ended with 86 people injured and 200 demonstrators arrested. There were worldwide protests against the US involvement in Vietnam, as well as widespread draft-dodging by US youth and insubordination in the US Army. April 20th; Tory MP Enoch Powell makes his anti-immigration "Rivers of Blood" speech; this sparks several demonstrations across England, including one by some London dockers in support of Powell. Definitely a year (and 1969) that opened this (then) young teen horizon's ..... and my world has never been the same since. Let's not forget the Langlois Affair that began on February 9, 1968. That was the day when Henri Langlois, the director of the Cinémathèque Française, which he had established, in the mid-thirties, with his friend Georges Franju, and dedicated to preserving and exhibiting movies from all periods and countries, was relieved of his position and replaced by a man named Pierre Barbin. Barbin was an obscure and relatively inexperienced film-festival organizer, and Langlois was a culture hero, a status recognized even by his adversaries. The reaction was nearly instantaneous. Langlois was dismissed on a Friday. Within twenty-four hours, forty filmmakers, including Abel Gance, François Truffaut, Jean-Luc Godard, Jean Renoir, and Robert Bresson, had withdrawn permission for their films to be shown at what was soon referred to as the Barbinothèque. They were quickly joined by dozens more, including Charlie Chaplin, Roberto Rossellini, Fritz Lang, Richard Lester, Carl Dreyer, Orson Welles, and Jerry Lewis. On Wednesday, a crowd of three thousand showed up at the Trocadéro, in front of the Palais de Chaillot. The demonstration was broken up by a police charge, leaving a number of people slightly wounded, including Truffaut, Godard, and Bernard Tavernier. By February 23rd, Cahiers du Cinéma, the critical organ of the New Wave, had collected signatures from more than seven hundred people protesting Langlois’s dismissal. Almost the entire French film industry, including directors, like Marcel Carné, who had little fondness for the Cahiers or the New Wave, put their names to the protest. So did more than a hundred foreign directors, among them Michelangelo Antonioni, Ingmar Bergman, Luis Buñuel, Peter Brook, Alfred Hitchcock, Elia Kazan, Akira Kurosawa, Pier Paolo Pasolini, Satyajit Ray, and Andy Warhol. Jean-Paul Belmondo, Brigitte Bardot, Catherine Deneuve, Marlene Dietrich, Jane Fonda, Katharine Hepburn, Peter O’Toole, Toshiro Mifune, and Gloria Swanson appeared on the list; so did Roland Barthes, Samuel Beckett, Alexander Calder, Truman Capote, Max Ernst, Eugène Ionesco, Pablo Picasso, Paul Ricoeur, and Jean-Paul Sartre. Telegrams continued to pour in: Henri Cartier-Bresson, Pauline Kael, Norman Mailer, Andrew Sarris, Susan Sontag, Iannis Xenakis. It was nearly a Who’s Who of postwar arts and letters. There were more demonstrations, more police violence, more telegrams and petitions. At one rally, Jean-Pierre Léaud, the actor who, as a fifteen-year-old, had played Antoine Doinel in Truffaut’s The 400 Blows (1959), and was therefore almost the incarnation of the New Wave spirit, gave a speech exhorting the crowd. The government backed down. On April 22nd, the general assembly of the Cinémathèque convened and voted to reinstate Langlois. The Cinémathèque was snatched back from the jaws of the state. On May 2nd, with some fanfare, Langlois reopened the Left Bank screening room, on the Rue d’Ulm. The next day, there were student demonstrations on the streets of Paris.